Chondrichthyes (/kɒnˈdrɪkθiiːz/; from Greek χονδρ- chondr- 'cartilage', ἰχθύς ichthys 'fish') is a class that contains the cartilaginous fishes: they are jawed vertebrates with paired fins, paired nares, scales, a heart with its chambers in series, and skeletons made of cartilage rather than bone. The class is divided into two subclasses: Elasmobranchii (sharks, rays, skates, and sawfish) and Holocephali (chimaeras, sometimes called ghost sharks, which are sometimes separated into their own class). Within the infraphylum Gnathostomata, cartilaginous fishes are distinct from all other jawed vertebrates. The skeleton is cartilaginous. The notochord is gradually replaced by a vertebral column during development, except in Holocephali, where the notochord stays intact. In some deepwater sharks, the column is reduced. As they do not have bone marrow, red blood cells are produced in the spleen and the epigonal organ (special tissue around the gonads, which is also thought to play a role in the immune system). They are also produced in the Leydig's organ, which is only found in certain cartilaginous fishes. The subclass Holocephali, which is a very specialized group, lacks both the Leydig's and epigonal organs. Apart from electric rays, which have a thick and flabby body, with soft, loose skin, chondrichthyans have tough skin covered with dermal teeth (again, Holocephali is an exception, as the teeth are lost in adults, only kept on the clasping organ seen on the caudal ventral surface of the male), also called placoid scales (or dermal denticles), making it feel like sandpaper. In most species, all dermal denticles are oriented in one direction, making the skin feel very smooth if rubbed in one direction and very rough if rubbed in the other. Originally, the pectoral and pelvic girdles, which do not contain any dermal elements, did not connect. In later forms, each pair of fins became ventrally connected in the middle when scapulocoracoid and pubioischiadic bars evolved. In rays, the pectoral fins have connected to the head and are very flexible. One of the primary characteristics present in most sharks is the heterocercal tail, which aids in locomotion. Chondrichthyans have toothlike scales called dermal denticles or placoid scales. Denticles usually provide protection, and in most cases, streamlining. Mucous glands exist in some species, as well. It is assumed that their oral teeth evolved from dermal denticles that migrated into the mouth, but it could be the other way around, as the teleost bony fish Denticeps clupeoides has most of its head covered by dermal teeth (as does, probably, Atherion elymus, another bony fish). This is most likely a secondary evolved characteristic, which means there is not necessarily a connection between the teeth and the original dermal scales. The old placoderms did not have teeth at all, but had sharp bony plates in their mouth. Thus, it is unknown whether the dermal or oral teeth evolved first. It has even been suggested[by whom?] that the original bony plates of all vertebrates are now gone and that the present scales are just modified teeth, even if both the teeth and body armor had a common origin a long time ago. However, there is currently no evidence of this. All chondrichthyans breathe through five to seven pairs of gills, depending on the species. In general, pelagic species must keep swimming to keep oxygenated water moving through their gills, whilst demersal species can actively pump water in through their spiracles and out through their gills. However, this is only a general rule and many species differ. A spiracle is a small hole found behind each eye. These can be tiny and circular, such as found on the nurse shark (Ginglymostoma cirratum), to extended and slit-like, such as found on the wobbegongs (Orectolobidae). Many larger, pelagic species, such as the mackerel sharks (Lamnidae) and the thresher sharks (Alopiidae), no longer possess them. 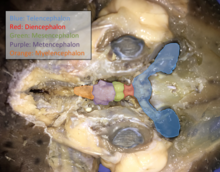 Regions of a Chondrichthyes brain colored and labeled on dissected skate. The rostral end of the skate is to the right. Chondrichthyes nervous system is composed of a small brain, 8-10 pairs of cranial nerves, and a spinal chord with spinal nerves. They have several sensory organs which provide information to be processed. Ampullae of Lorenzini are a network of small jelly filled pores called electroreceptors which help the fish sense electric fields in water. This aids in finding prey, navigation, and sensing temperature. The Lateral line system has modified epithelial cells located externally which sense motion, vibration, and pressure in the water around them. Most subspecies have large well-developed eyes. Also, they have very powerful nostrils and olfactory organs. Their inner ears consist of 3 large semicircular canals which aid in balance and orientation. Their sound detecting apparatus has limited range and is typically more powerful at lower frequencies. Some subspecies have electric organs which can be used for defense and predation. They have relatively simple brains with the forebrain not greatly enlarged. The structure and formation of myelin in their nervous systems are nearly identical to that of tetrapods, which has led evolutionary biologists to believe that Chondrichthyes were a cornerstone group in the evolutionary timeline of myelin development. Like all other jawed vertebrates, members of Chondrichthyes have an adaptive immune system. Fertilization is internal. Development is usually live birth (ovoviviparous species) but can be through eggs (oviparous). Some rare species are viviparous. There is no parental care after birth; however, some chondrichthyans do guard their eggs. Capture-induced premature birth and abortion (collectively called capture-induced parturition) occurs frequently in sharks/rays when fished. Capture-induced parturition is often mistaken for natural birth by recreational fishers and is rarely considered in commercial fisheries management despite being shown to occur in at least 12% of live bearing sharks and rays (88 species to date). The class Chondrichthyes has two subclasses: the subclass Elasmobranchii (sharks, rays, skates, and sawfish) and the subclass Holocephali (chimaeras). To see the full list of the species, click here. and rays, skates, and sawfish Elasmobranchii is a subclass that includes the sharks and the rays and skates. Members of the elasmobranchii have no swim bladders, five to seven pairs of gill clefts opening individually to the exterior, rigid dorsal fins, and small placoid scales. The teeth are in several series; the upper jaw is not fused to the cranium, and the lower jaw is articulated with the upper. The eyes have a tapetum lucidum. The inner margin of each pelvic fin in the male fish is grooved to constitute a clasper for the transmission of sperm. These fish are widely distributed in tropical and temperate waters. Chimaeras Holocephali (complete-heads) is a subclass of which the order Chimaeriformes is the only surviving group. This group includes the rat fishes (e.g., Chimaera), rabbit-fishes (e.g., Hydrolagus) and elephant-fishes (Callorhynchus). Today, they preserve some features of elasmobranch life in Paleaozoic times, though in other respects they are aberrant. They live close to the bottom and feed on molluscs and other invertebrates. The tail is long and thin and they move by sweeping movements of the large pectoral fins. There is an erectile spine in front of the dorsal fin, sometimes poisonous. There is no stomach (that is, the gut is simplified and the 'stomach' is merged with the intestine), and the mouth is a small aperture surrounded by lips, giving the head a parrot-like appearance. The fossil record of the Holocephali starts in the Devonian period. The record is extensive, but most fossils are teeth, and the body forms of numerous species are not known, or at best poorly understood. 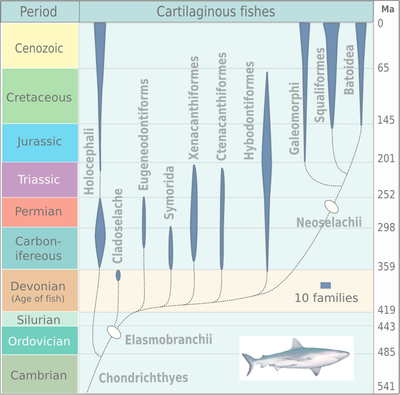 Radiation of cartilaginous fishes, based on Michael Benton, 2005. Cartilaginous fish are considered to have evolved from acanthodians.By whom? Originally assumedBy whom? to be closely related to bony fish or a polyphyletic assemblage leading to both groups, the discovery of Entelognathus and several examinations of acanthodian characteristics indicate that bony fish evolved directly from placoderm like ancestors, while acanthodians represent a paraphyletic assemblage leading to Chondrichthyes. Some characteristics previously thought to be exclusive to acanthodians are also present in basal cartilaginous fish. In particular, new phylogenetic studies find cartilaginous fish to be well nested among acanthodians, with Doliodus and Tamiobatis being the closest relatives to Chondrichthyes. Recent studies vindicate this, as Doliodus had a mosaic of chondrichthyian and acanthodiian traits. Dating back to the Middle and Late Ordovician Period, many isolated scales, made of dentine and bone, have a structure and growth form that is chondrichthyan-like. They may be the remains of stem-chondrichthyans, but their classification remains uncertain. The earliest unequivocal fossils of cartilaginous fishes first appeared in the fossil record by about 430 million years ago, during the middle Wenlock Epoch of the Silurian period. The radiation of elasmobranches in the chart on the right is divided into the taxa: Cladoselache, Eugeneodontiformes, Symmoriida, Xenacanthiformes, Ctenacanthiformes, Hybodontiformes, Galeomorphi, Squaliformes and Batoidea. By the start of the Early Devonian, 419 million years ago, jawed fishes had divided into three distinct groups: the now extinct placoderms (a paraphyletic assemblage of ancient armoured fishes), the bony fishes, and the clade that includes spiny sharks and early cartilaginous fish. The modern bony fishes, class Osteichthyes, appeared in the late Silurian or early Devonian, about 416 million years ago. The first abundant genus of shark, Cladoselache, appeared in the oceans during the Devonian Period. The first Cartilaginous fishes evolved from Doliodus-like spiny shark ancestors. A Bayesian analysis of molecular data suggests that the Holocephali and Elasmoblanchii diverged in the Silurian (421 million years ago) and that the sharks and rays/skates split in the Carboniferous (306 million years ago). Cladoselache Cladoselache was the first abundant genus of primitive shark, appearing about 370 Ma. It grew to 6 feet (1.8 m) long, with anatomical features similar to modern mackerel sharks. It had a streamlined body almost entirely devoid of scales, with five to seven gill slits and a short, rounded snout that had a terminal mouth opening at the front of the skull. It had a very weak jaw joint compared with modern-day sharks, but it compensated for that with very strong jaw-closing muscles. Its teeth were multi-cusped and smooth-edged, making them suitable for grasping, but not tearing or chewing. Cladoselache therefore probably seized prey by the tail and swallowed it whole. It had powerful keels that extended onto the side of the tail stalk and a semi-lunate tail fin, with the superior lobe about the same size as the inferior. This combination helped with its speed and agility which was useful when trying to outswim its probable predator, the heavily armoured 10 metres (33 ft) long placoderm fish Dunkleosteus. Carboniferous (359–299 Ma): Sharks underwent a major evolutionary radiation during the Carboniferous. It is believed that this evolutionary radiation occurred because the decline of the placoderms at the end of the Devonian period caused many environmental niches to become unoccupied and allowed new organisms to evolve and fill these niches. Orthacanthus senckenbergianus The first 15 million years of the Carboniferous has very few terrestrial fossils. This gap in the fossil record, is called Romer's gap after the American palaentologist Alfred Romer. While it has long been debated whether the gap is a result of fossilisation or relates to an actual event, recent work indicates that the gap period saw a drop in atmospheric oxygen levels, indicating some sort of ecological collapse. The gap saw the demise of the Devonian fish-like ichthyostegalian labyrinthodonts, and the rise of the more advanced temnospondyl and reptiliomorphan amphibians that so typify the Carboniferous terrestrial vertebrate fauna. The Carboniferous seas were inhabited by many fish, mainly Elasmobranchs (sharks and their relatives). These included some, like Psammodus, with crushing pavement-like teeth adapted for grinding the shells of brachiopods, crustaceans, and other marine organisms. Other sharks had piercing teeth, such as the Symmoriida; some, the petalodonts, had peculiar cycloid cutting teeth. Most of the sharks were marine, but the Xenacanthida invaded fresh waters of the coal swamps. Among the bony fish, the Palaeonisciformes found in coastal waters also appear to have migrated to rivers. Sarcopterygian fish were also prominent, and one group, the Rhizodonts, reached very large size. Most species of Carboniferous marine fish have been described largely from teeth, fin spines and dermal ossicles, with smaller freshwater fish preserved whole. Freshwater fish were abundant, and include the genera Ctenodus, Uronemus, Acanthodes, Cheirodus, and Gyracanthus. As a result of the evolutionary radiation, carboniferous sharks assumed a wide variety of bizarre shapes; e.g., sharks belonging to the family Stethacanthidae possessed a flat brush-like dorsal fin with a patch of denticles on its top. Stethacanthus' unusual fin may have been used in mating rituals. Apart from the fins, Stethacanthidae resembled Falcatus (below). Falcatus Falcatus is a genus of small cladodont-toothed sharks which lived 335–318 Ma. They were about 25–30 cm (9.8–11.8 in) long. They are characterised by the prominent fin spines that curved anteriorly over their heads. Orodus Orodus is another shark of the Carboniferous, a genus from the family Orodontidae that lived into the early Permian from 303 to 295 Ma. It grew to 2 m (6.6 ft) in length. Permian (298–252 Ma): The Permian ended with the most extensive extinction event recorded in paleontology: the Permian-Triassic extinction event. 90% to 95% of marine species became extinct, as well as 70% of all land organisms. Recovery from the Permian-Triassic extinction event was protracted; land ecosystems took 30M years to recover, and marine ecosystems took even longer. Triassic (252–201 Ma): The fish fauna of the Triassic was remarkably uniform, reflecting the fact that very few families survived the Permian extinction. In turn, the Triassic ended with the Triassic–Jurassic extinction event. About 23% of all families, 48% of all genera (20% of marine families and 55% of marine genera) and 70% to 75% of all species became extinct. Cretaceous (145–66 Ma): The end of the Cretaceous was marked by the Cretaceous–Paleogene extinction event (K-Pg extinction). There are substantial fossil records of jawed fishes across the K–T boundary, which provides good evidence of extinction patterns of these classes of marine vertebrates. Within cartilaginous fish, approximately 80% of the sharks, rays, and skates families survived the extinction event, and more than 90% of teleost fish (bony fish) families survived. Ptychodus Ptychodus is a genus of extinct hybodontiform shark which lived from the late Cretaceous to the Paleogene. Ptychodus mortoni (pictured) was about 32 feet (9.8 meters) long and was unearthed in Kansas, United States. Cenozoic Era (65 Ma to present): The current era has seen great diversification of bony fishes. Megalodon is an extinct species of shark that lived about 28 to 1.5 Ma. It looked much like a stocky version of the great white shark, but was much larger with fossil lengths reaching 20.3 metres (67 ft). Found in all oceans it was one of the largest and most powerful predators in vertebrate history, and probably had a profound impact on marine life. ^ Botella, H.A. ; Donoghue, P.C.J. ; Martínez-Pérez, C. (2009). "Enameloid microstructure in the oldest known chondrichthyan teeth". Acta Zoologica. 90 (Supplement): 103–108. doi:10.1111/j.1463-6395.2008.00337.x. ^ "Chondrichthyes". PalaeoDB. Retrieved 26 November 2013. ^ Wilga, C. D.; Lauder, G. V. (2002). "Function of the heterocercal tail in sharks: quantitative wake dynamics during steady horizontal swimming and vertical maneuvering". Journal of Experimental Biology. 205 (16): 2365–2374. PMID 12124362. ^ Collin, Shaun P. (2012). "The Neuroecology of Cartilaginous Fishes: Sensory Strategies for Survival". Brain, Behavior and Evolution. 80 (2): 80–96. doi:10.1159/000339870. ISSN 1421-9743. PMID 22986825. ^ de Bellard, Maria Elena (15 June 2016). "Myelin in cartilaginous fish". Brain Research. 1641 (Pt A): 34–42. doi:10.1016/j.brainres.2016.01.013. ISSN 0006-8993. PMC 4909530. PMID 26776480. ^ a b Adams, Kye R.; Fetterplace, Lachlan C.; Davis, Andrew R.; Taylor, Matthew D.; Knott, Nathan A. (January 2018). "Sharks, rays and abortion: The prevalence of capture-induced parturition in elasmobranchs". Biological Conservation. 217: 11–27. doi:10.1016/j.biocon.2017.10.010. ^ Haaramo, Mikko. Chondrichthyes – Sharks, Rays and Chimaeras. Retrieved 22 October 2013. ^ Benton, M. J. (2005). Vertebrate Palaeontology (3rd ed.). Blackwell. Fig 7.13 on page 185. ISBN 978-0-632-05637-8. ^ Min Zhu; Xiaobo Yu; Per Erik Ahlberg; Brian Choo; Jing Lu; Tuo Qiao; Qingming Qu; Wenjin Zhao; Liantao Jia; Henning Blom; You'an Zhu (2013). "A Silurian placoderm with osteichthyan-like marginal jaw bones". Nature. 502 (7470): 188–193. Bibcode:2013Natur.502..188Z. doi:10.1038/nature12617. PMID 24067611. ^ Burrow, CJ; Den Blaauwen, J.; Newman, MJ; Davidson, RG (2016). "The diplacanthid fishes (Acanthodii, Diplacanthiformes, Diplacanthidae) from the Middle Devonian of Scotland". Palaeontologia Electronica. doi:10.26879/601. ^ Maisey, John G.; Miller, Randall; Pradel, Alan; Denton, John S.S.; Bronson, Allison; Janvier, Philippe (2017). "Pectoral Morphology in Doliodus: Bridging the 'Acanthodian'-Chondrichthyan Divide". American Museum Novitates. 3875 (3875): 1–15. doi:10.1206/3875.1. ^ Andreev, Plamen S.; Coates, Michael I.; Shelton, Richard M.; Cooper, Paul R.; Smith, M. Paul; Sansom, Ivan J. (2015). "Ordovician chondrichthyan-like scales from North America". Palaeontology. 58 (4): 691–704. doi:10.1111/pala.12167. ^ Sansom, Ivan J.; Davies, Neil S.; Coates, Michael I.; Nicoll, Robert S.; Ritchie, Alex (2012). "Chondrichthyan-like scales from the Middle Ordovician of Australia". Palaeontology. 55 (2): 243–247. doi:10.1111/j.1475-4983.2012.01127.x. ^ Andreev, Plamen; Coates, Michael I.; Karatajūtė-Talimaa, Valentina; Shelton, Richard M.; Cooper, Paul R.; Wang, Nian-Zhong; Sansom, Ivan J. (2016). "The systematics of the Mongolepidida (Chondrichthyes) and the Ordovician origins of the clade". PeerJ. 4: e1850. doi:10.7717/peerj.1850. PMC 4918221. PMID 27350896. ^ Märss, Tiiu; Gagnier, Pierre-Yves (2001). "A new chondrichthyan from the Wenlock, Lower Silurian, of Baillie-Hamilton Island, the Canadian Arctic". Journal of Vertebrate Paleontology. 21 (4): 693–701. doi:10.1671/0272-4634(2001)021[0693:ANCFTW]2.0.CO;2. ^ a b c d The Marshall Illustrated Encyclopedia of Dinosaurs and Prehistoric Animals 1999, p. 26. ^ a b c d R. Aidan Martin. "A Golden Age of Sharks". Biology of Sharks and Rays. Retrieved 26 November 2013. ^ Ward, P.; Labandeira, C.; Laurin, M.; Berner, R. A. (2006). "Confirmation of Romer's Gap is a low oxygen interval constraining the timing of initial arthropod and vertebrate terrestrialization". Proceedings of the National Academy of Sciences. 103 (45): 16818–16822. Bibcode:2006PNAS..10316818W. doi:10.1073/pnas.0607824103. PMC 1636538. PMID 17065318. ^ Sahney, S.; Benton, M.J. (2008). "Recovery from the most profound mass extinction of all time". Proceedings of the Royal Society B. 275 (1636): 759–65. doi:10.1098/rspb.2007.1370. PMC 2596898. PMID 18198148. ^ Baez. John (2006) Extinction University of California. Retrieved 20 January 2013. ^ "extinction". Math.ucr.edu. Retrieved 26 November 2013. ^ MacLeod, N; Rawson, PF; Forey, PL; Banner, FT; Boudagher-Fadel, MK; Bown, PR; Burnett, JA; Chambers, P; Culver, S; Evans, SE; Jeffery, C; Kaminski, MA; Lord, AR; Milner, AC; Milner, AR; Morris, N; Owen, E; Rosen, BR; Smith, AB; Taylor, PD; Urquhart, E; Young, JR (1997). "The Cretaceous–Tertiary biotic transition". Journal of the Geological Society. 154 (2): 265–292. Bibcode:1997JGSoc.154..265M. doi:10.1144/gsjgs.154.2.0265. Archived from the original on 31 October 2007. ^ Patterson, C (1993). Osteichthyes: Teleostei. In: The Fossil Record 2 (Benton, MJ, editor). Springer. pp. 621–656. ISBN 978-0-412-39380-8. ^ "Giant predatory shark fossil unearthed in Kansas". BBC - Earth News. 24 February 2010. ^ a b Wroe, S.; Huber, D. R.; Lowry, M.; McHenry, C.; Moreno, K.; Clausen, P.; Ferrara, T. L.; Cunningham, E.; Dean, M. N.; Summers, A. P. (2008). 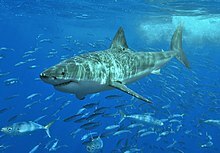 "Three-dimensional computer analysis of white shark jaw mechanics: how hard can a great white bite?" (PDF). Journal of Zoology. 276 (4): 336–342. doi:10.1111/j.1469-7998.2008.00494.x. ^ Pimiento, Catalina; Dana J. Ehret; Bruce J. MacFadden; Gordon Hubbell (10 May 2010). Stepanova, Anna (ed.). "Ancient Nursery Area for the Extinct Giant Shark Megalodon from the Miocene of Panama". PLoS ONE. 5 (5): e10552. Bibcode:2010PLoSO...510552P. doi:10.1371/journal.pone.0010552. PMC 2866656. PMID 20479893. ^ Lambert, Olivier; Bianucci, Giovanni; Post, Klaas; de Muizon, Christian; Salas-Gismondi, Rodolfo; Urbina, Mario; Reumer, Jelle (1 July 2010). "The giant bite of a new raptorial sperm whale from the Miocene epoch of Peru". Nature. 466 (7302): 105–108. Bibcode:2010Natur.466..105L. doi:10.1038/nature09067. PMID 20596020. ^ Coates, M.; Gess, R.; Finarelli, J.; Criswell, K.; Tietjen, K. (2016). "A symmoriiform chondrichthyan braincase and the origin of chimaeroid fishes". Nature. 541 (7636): 208–211. Bibcode:2017Natur.541..208C. doi:10.1038/nature20806. PMID 28052054.